How many times have you wanted to just get revenge and take out your fury at the injustices you have suffered quietly? Well, these three young teens go for it even though they find there are consequences to your actions. Meg, quietly stoic, is a foster child. living with daily abuse from her guardian, who refuses to feed or clothe her properly even though the state pays her. Stephanie, an outspoken activist, who weeps for the earth and all of the damage that is being done to it. Alix is an anger surfer girl, outraged by the bullies that abound in the sea. Together they channel their anger and seek revenge on those who have wronged them and others. 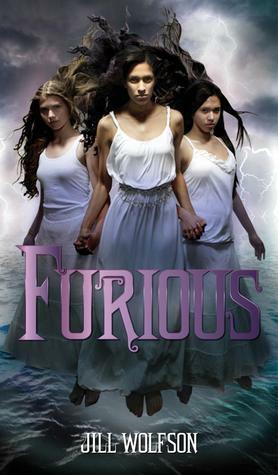 This is a smart and updated version of the Greek Furies mythology of three females who were put on earth to avenge the weak and those causing evil. These girls are a modern spin with each one tackling current issues of ecology, bullies, and the poor. I really enjoyed the connection these girls had together and how that bond made them stronger. Although they soon realized that the power could be used for evil as well. The characters are all nicely developed and I would really like to read more about them. I'm so glad to see a positive review of this! So many folks have been disappointed by it, but I still really want to read it. Hopefully I'll like it as much as you did! Hi! I got your link from Book Blogs. I am now following you via GFC. Please visit my blog and if you enjoy it, please follow me and leave a comment. I appreciate the support. Sounds like a good concept. I'll have to keep it in mind. I really like the sound of this one I'm a sucker for greek myths and such so I'm glad this was a winner!